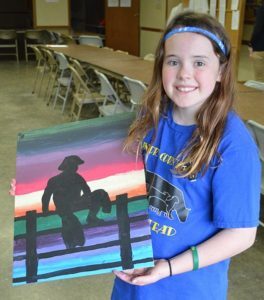 Hope Baysinger shows off her canvas painting of a cowboy sitting on a fence. It was a busy day at the 4-H Grounds in Forestburg on Easter Monday. Sanborn County 4-H decided to take advantage of the day off for students and offered a Special Project Day featuring workshops on photography and canvas painting. … Read more and see more pictures in this week’s issue of the Sanborn Weekly Journal. Blackhawks Kayla Olson and Myah Selland will be recognized at the Argus Leader Media Sports Awards Ceremony on June 3 at the Sanford Pentagon in Sioux Falls. The Argus Leader honors the most elite athletes in South Dakota high school sports. Olson will be recognized for the Nike “I Am Sport” award, and Selland will receive the Girls Basketball Award. The celebrity speaker at the event will be Cal Ripken, Jr.
Tickets to attend are $35. 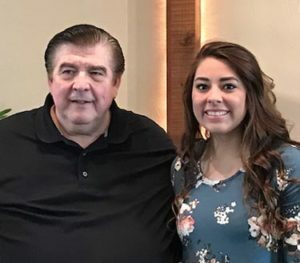 KYLA MORGAN pictured with Letcher Community Church’s Pastor, Gary Swagger. Woonsocket High School senior Kyla Morgan was honored Sunday morning at the Letcher Community Church. At the conclusion of the church service, Morgan was presented with a scholarship of $500. The scholarship was donated anonymously. Morgan has been a great asset to various programs at the church and has been a part of the church’s summer youth program. Morgan completed confirmation in 2013 and has continued in Rock Solid, the senior youth group, to the present time.